Harmony and balance in the kimono structure and how it lends itself to symmetry inspires artist Judith Content. 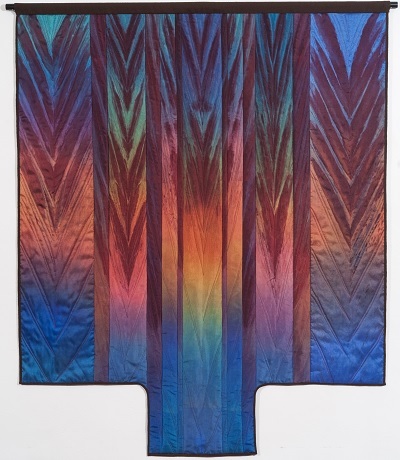 She constructs her quilts intuitively, using a contemporary approach to the Japanese dye technique of arashi-shibori. Kimono Quilts and Kimonos features the works of a wide range of artists including Therese May, Yvonne Porcella, Sugar Rieck, Ans Schipper-Vermeiren, and Sarah Ann Smith. Another show, Antique Four-Poster Quilts, features antique bed quilts from the 1800s. Their lack of corners allowed the quilt to easily fit around the bed’s posts. To learn more about these fascinating exhibits, visit the Texas Quilt Museum website. Museum in Harrisburg, Pennsylvania, through August 30, 2015. Caldwell, Fran Skiles, Ginny Smith, and Dinah Sargeant. Carol A. Sinnreich’s beautiful art quilts are in a Smilebox slide show presented by The Quilt Show. 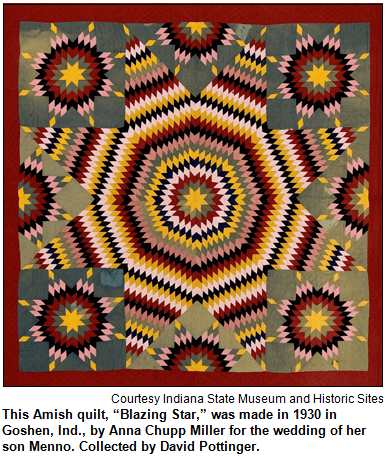 At the Indiana State Museum, a special exhibit, 19 Stars: Quilts of Indiana’s Present and Past, opened June 13, featuring a collection of contemporary and historic quilts and will run through October 4, 2015. Currently, many Indiana quilt artists have been inspired by the upcoming Indiana Bicentennial to create quilts with themes featuring 19 stars because Indiana became the nineteenth state in 1816 and also because the inclusion of stars in patterns also was a favorite of quilters during the 1800s and 1900s. The exhibit, incorporating the star theme, consists of 19 historic quilts from the Museum’s Collection and 19 contemporary quilts, most of which were created and made for the exhibit. Mary Jane Teeters-Eichacker is the curator. A World of Beauty exhibit by International Quilt Association, Houston, Texas. Smile box slide show is presented by The Quilt Show.